Patios can make your outdoor space more enjoyable, increase your home’s value, and not so insignificantly, save you money on landscape maintenance costs. What type of patio is right for you? Any number of colors and patterns may be installed in a variety of materials. Pros and cons for a few of the most popular are discussed here. The color and characteristics of flagstone result from the natural process by which it forms, a slow and gradual accumulation of layers of sand, clay, mineral and organic sediments. The most common colors available are red, blue, and buff, with regional varieties like Arizona sandstone and Pennsylvania bluestone among the most popular. Flagstone patios are unmistakable—and hard to resist, if you favor the material’s earthy, timeless appearance. Irregularly shaped and sized, quarried flagstones are heavy and rather difficult to work with, especially for the inexperienced do-it-yourselfer. Since flagstone is subject to erosion and splitting, a successful flagstone patio design prioritizes adequate drainage. Note: Different types of flagstone entail different maintenance requirements. Sandstone has a cooler temperature in summer, but it’s porous and prone to water damage. Bluestone is more durable but requires a sealer to maintain its coloring. A time-tested, enduringly popular patio building material is clay brick, which offers a distinguished aesthetic that complements both traditional and contemporary architecture. Over time, bricks usually retain their rich, warm color, and due to their handy weight and size, installing them in a patio is DIY-friendly work. Mortar is not strictly necessary; bricks can be laid easily on a dry bed of sand. 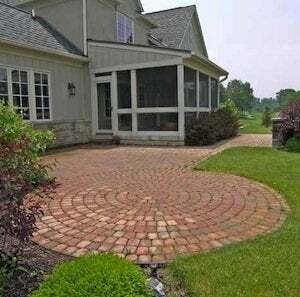 Homeowners love brick’s versatility—myriad patterns are possible, from rectangular to round. Reclaimed brick, though typically more expensive, has grown in popularity owing to its “green” status and unique look. Note: Though it may crack with wintertime freeze-thaw cycles, brick is otherwise durable, and individual damaged bricks are easily replaced. Pavers come in forms as varied as natural stone, concrete, clay and even recycled plastics. For patio installations, experts recommend either stone or concrete pavers, which, due to their higher density, may be expected to last longer and undergo less color fading than other paver types. Concrete pavers in particular are a mainstay of patio building, beloved for their easy installation and the range of sizes, shapes, and colors in which they can be found. Inevitably, this manmade product lends itself to a less “natural” look, although some concrete pavers are manufactured to look like natural stone or clay brick. Note: With the exception of interlocking designs, all pavers will spread over time. To maintain the shape of your patio, be sure to ring your paver installation with a border of pressure-treated lumber. Concrete patios are typically one of the least expensive to build. Assuming proper installation and maintenance, they are one of the most durable, too, though like brick, concrete is subject to cracking with freeze-thaw cycles. Since poured concrete follows any form, unlimited patio design options are possible. If your dream patio is one covered with glazed decorative tiles, a concrete slab is the way to go, as it will provide a solid, even base on which to add tiles in future. Note: Control storm water runoff by devising the shape, depth, and slope of your poured concrete patio in such a way that adequate drainage is achieved. If you are looking for a patio material that may be installed quickly and easily, look no further than gravel. Usually two types are available, river rock or crushed stone (in sizes ranging from a quarter-inch to one inch in diameter). When installed over landscaping fabric, gravel effectively deters weed growth, and compared to other materials, it offers excellent drainage. Note: Round, pebble-like gravel stones are more likely to shift than angular, crushed gravel stones; in a high-traffic area like the patio, it may be wise to insist on the latter.